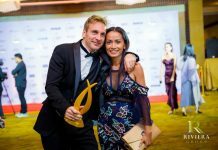 Owners of the new Siamese Hotel embraced their social-media devotees by hosting a “Click, Like & Share” party recently to introduce the Naklua resort to its Facebook fans. Chris Cherdsuriya, manager of the hotel on Third Road near Soi Potisan, welcomed city officials and former MPs to the pre-opening party Nov. 15, along with those who’d followed the development of the hotel on the Facebook website. 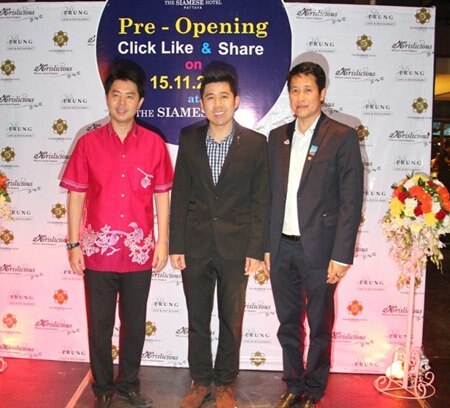 (L-R) Poramet Ngampichet, former MP of Pak Palangchon Region 7, Chris Cherdsuriya, Managing Director of the Siamese Hotel, and Bangjong Bantoonprayuk, deputy host of Pattaya pose for a photo at the pre-opening ‘Click, Like & Share’ party held at the Siamese Hotel on Nov. 15. Cherdsuriya said the new hotel has four-star ambitions and 300 million baht was spent on the property. Its 123 rooms are decorated in classic and traditional Thai styles with an eye toward the Asian market. 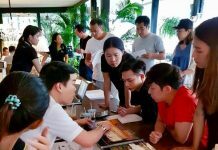 Facebook users who clicked “Like” on the hotel’s page got a chance to see the Siamese’s rooms and facilities before it opens to the public, including its swimming pool, fitness center and conference room capable of hosting 250 people. The Siamese Hotel is offering pre-opening booking specials of up to 50 percent off rooms, 10 percent off food and beverage and membership cards offering another 15 percent off. For more information, call 038-0425-668-72.